Michael and I got invited to the Nike Employee Store recently by his step-brother Doug. We’d never been and honestly I didn’t know what to expect. I figured it was just like the outlet store. It was better! Everything was at least 50% off the regular price, so much better than the outlet. I ended up getting some new workout shorts and capris, a t-shirt and some shoes. It was a great deal! After shopping, we decided to stop somewhere for dinner to avoid the icky traffic that is Highway 26. Neither of us go to Beaverton very often (it’s a suburb of Portland) and it’s kind of a weird place–land of strip malls and chain stores. The traffic is terrible, too. So an impromptu date night was just right. Michael suggested the Hall Street Grill. I’d never been and it had been many years since he was there. I was pleasantly surprised at how classy and beautiful the interior was. It was very charming and the tables were intimate. Our server was top-notch. He was clearly someone who loved being a waiter and was really good at it. He was friendly and easy going, prompt and had suggestions for us. 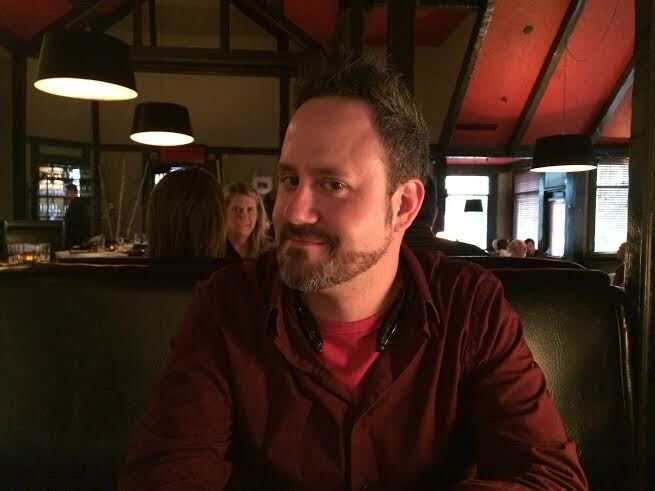 Michael tried a whiskey he’d never heard of before and enjoyed it– the WhistlePig Straight Rye. The waiter brought a bread basket which we hungrily ate despite trying to avoid bread. It came with the most amazing butter I’ve ever had. It was whipped; light and creamy and had (I think) sweet onion in it. The butter was sweet and it was so good! 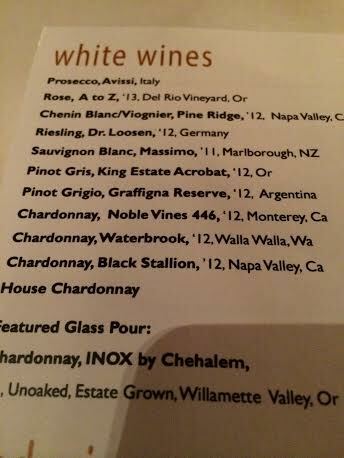 I asked the waiter about the white wine and what he suggested. I said I liked a dry, crisp pinot gris/grigio. He suggested either the Pinot Grigio Graffigna Reserve or the Waterbrook Chardonnay. I’m not really a fan of chardonnay but he said this was made in a steel barrel or something instead of oak. He brought a taste of both for me to decide. 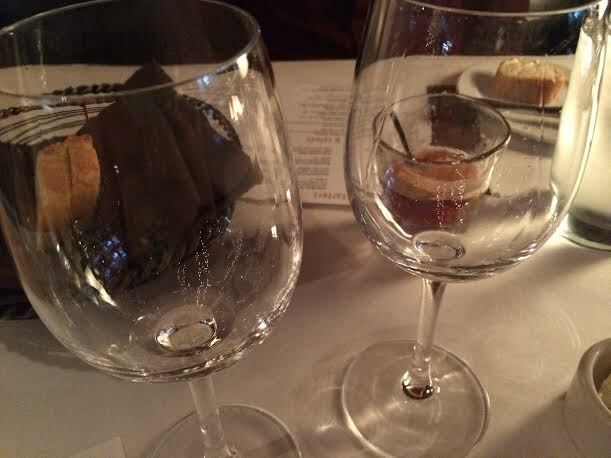 I knew the second he set the glasses down on the table which one I would order (the Pinot). 🙂 I could tell by the crisp, almost clear color that it was what I wanted. 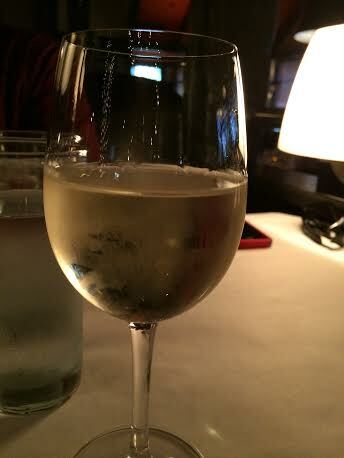 The chardonnay had a buttery, light caramel color to it. I loved the pinot! I decided to go light on dinner. 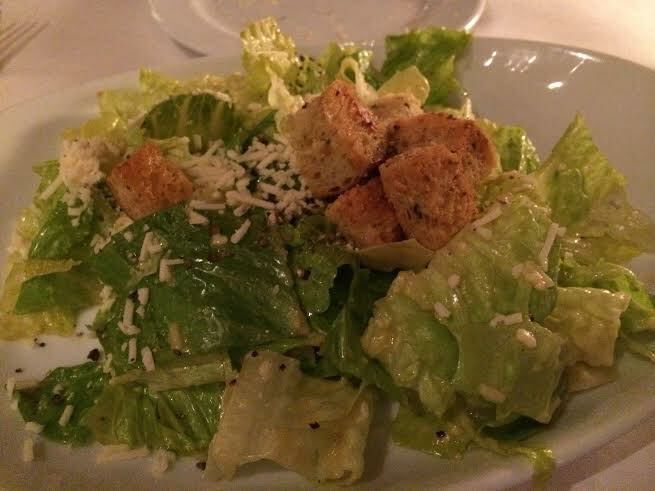 I ordered a side Caesar salad and a starter plate that turned out to be just the right amount of food for me. 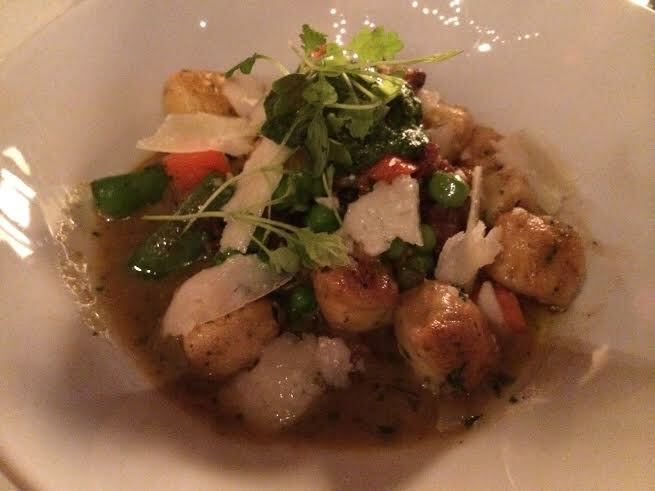 My dinner was the housemade gnocchi. It came with peas, carrots, snap peas, lamb sausage, hazelnut pesto, and large flakes of pecorino. I had to say it was probably one of the best pasta dishes I’ve had in a very long time. The gnocchi was tender and soft. The sauce was so amazing I couldn’t stop eating it and wished there was more when I was done. The snap peas were crunchy and the other vegetables were fresh and flavorful. I absolutely adored this dish! Everything went together nicely and I know this will be a dish I’ll think about for a long time. 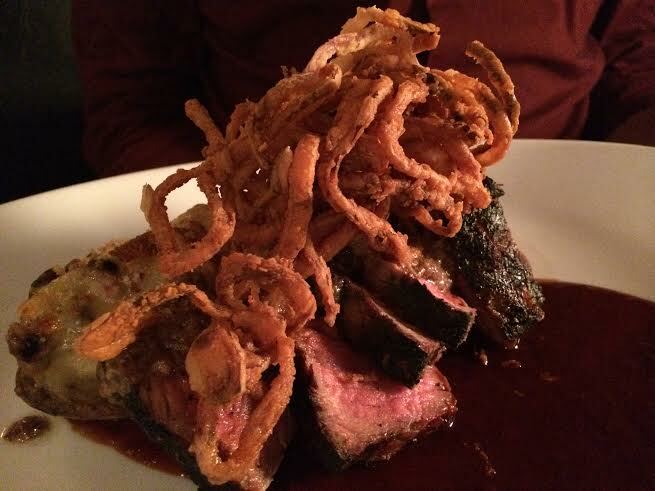 Michael ordered the NY strip steak. It was cooked in a port wine demi glace that was rich in flavor and color. It came with a twice baked potato topped with chanterelle and shitake mushrooms, gorgonzola cheese and there were crunchy onions on top of the steak. I had a bite of his steak. The sauce was so rich and the steak was done just right. I REALLY wanted one of those crunchy onions on top but Michael wasn’t sharing that. 🙂 We did not have room for dessert, but their menu looked great! It was a lovely dinner and I’d most definitely go back to the Hall Street Grill–even if it IS all the way in Beaverton. The food was fantastic–kudos to the chef! The prices were a little on the spendy side but they do offer happy hour in the large bar area. There is a large parking lot, which makes it easy, and it looked like they had a big banquet room for events. We got home in record time, having missed all the ugly traffic, and I played with Bella for a bit before bedtime. She is such a good puppy! She’s very good with sharing. A lot of dogs don’t like to share their toys and get possessive and growl. Bella doesn’t do that. She will happily give you her toy (as long as you throw it so she can chase it). It was a nice, low key evening. I love impromptu date nights like that! That gnocchi looks amazing – our restaurant makes them in house and use half potato and half ricotta cheese so they are super light. Those sound amazing! I’ve never tried making my own gnocchi. Someday. The food you post always looks so amazing!! Nice score at the Nike store. Yep! And we found some stuff for the groomsman for the wedding. Sounds like a great evening! Your comment about the butter reminds me of the butter I had at a hotel in Germany in January – it had curry spices blended in — yum! Oh wow, that butter sounds great! I wonder if it would be easy to recreate at home. I’m not a fan of Beaverton & I live there! If you go out that way again, try Best Baguette next to Hall Street. Fantastic Bahn Mi. I’ve been to the one on SE Powell. So good!